Please include the names or custom lettering you would like on your print as well as the date of your event. 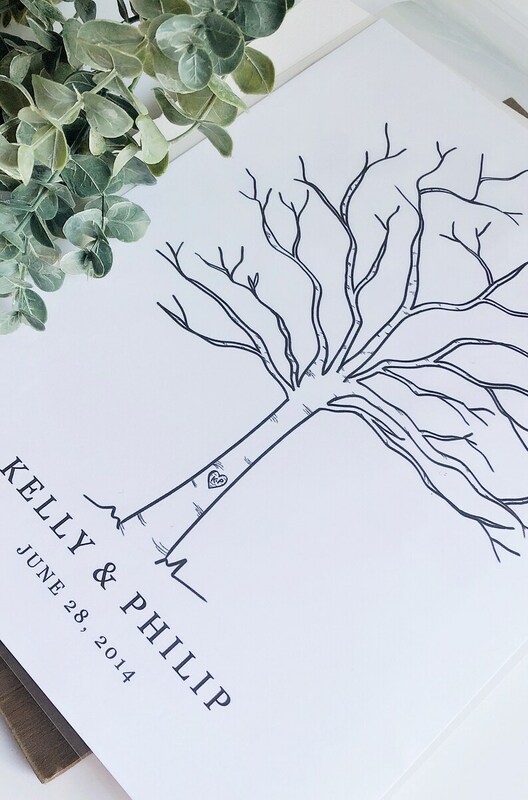 Each tree is customized to feature your initials carved into the trunk of the tree as well as custom lettering at the base of the tree and optional date. 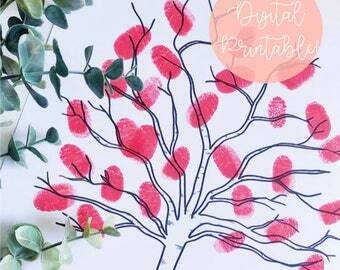 Your guests are encouraged to "leaf" their fingerprint and small signature to create the effect of a full tree. + Each print is hand-drawn by me then printed on cardstock weighted paper for durability. + Measures 8.5" x 11"
+ This print size is perfect for about 15-30 fingerprints and signatures. In the 'notes' section at checkout, please indicate the initials, names, and date that you would like lettered onto your print. + Processing time is quick! Allow 1-2 days for processing and shipping! + Expedited shipping is available at checkout. + Each print is protected in a plastic sleeve and mailed in a bubble mailer to ensure a safe delivery. SAVE TIME AND DOWNLOAD YOUR FINGERPRINT TREE!